Nov 11, The hacktivist group Anonymous hacked and take down several Muslim Brotherhood sites by launching the DDOS attack(started from friday evening). According to the Anonymous statement, the attack will continue until Friday,Nov 18,2011. They announced that they are going to hack those sites with operation named as "Operation Brotherhood" before few days. According to the Muslim Brotherhood, the attacks began at 6pm on Friday against the group’s official website, Ikhwanonline, with 120 thousand hits per second. The hackers later escalated their attack on the site to 380 thousand hits per second. 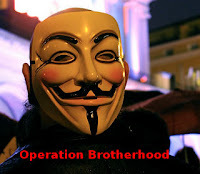 Under the heavy attack of DDOS, 4 Muslim brotherhood sites take down temporarily.